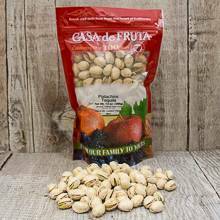 We use the finest large pistachios and roast and salt them adding a hint of tequila and lemon. his creates a salty flavor with a citrus zest that everyone will enjoy. Packaged in a 14 oz. bag. From N. Sanchez of Al Udeid Air Base, Qatar on 12/22/2010 .